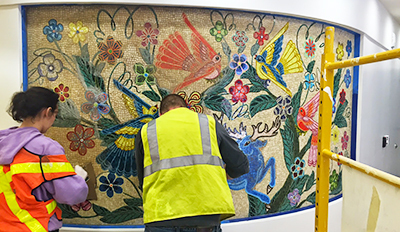 Terminal 3 at San Francisco International Airport is about to receive a large mosaic mural by local artist Amy Ellingson. 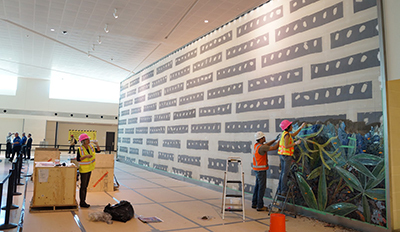 Strikingly contemporary yet informed by traditional techniques, this artwork reflects the new and updated role of the public space at the airport. Click here to view Amy’s BLOG. Mosaika is in San Francisco working on the San Francisco General Hospital Rebuild Project. The close to half a million square feet that is being added to the original hospital, which has been in operation since 1872, includes many public art pieces. Mosaika is working on 6 mosaics with three different artists; three hand made ceramic pieces by Lena Wolff, one glass and ceramic piece by Jet Martinez and two large glass and ceramic pieces in the lobby by Rupert Garcia. 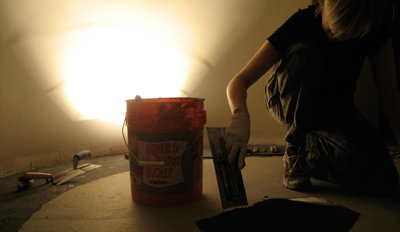 Mosaika is once again working with visual artist Lynn Basa. 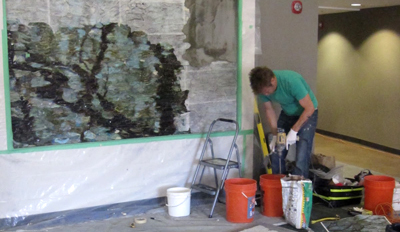 Together, they have created a 300 square foot byzantine style glass mosaic for the newly renovated historic capitol theatre in downtown Salt Lake City. Mosaika is in Florida installing 5 mosaics at the Sarasota National Cemetery’s new amphitheatre.The artist Mosaika is working with is Ellen Driscoll, a Brooklyn based mixed media artist. The 5 mosaics include two floor pieces, a mural and two spires. Mosaika is in Harlem at the newly built Mother Clara Hale Bus Depot. 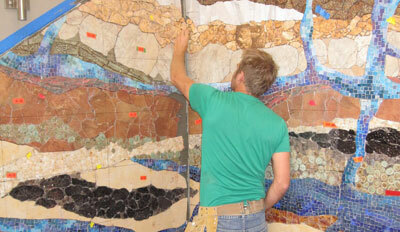 We are installing a 2500 square foot mosaic made of stained glass, hand made ceramics and glass smalti. 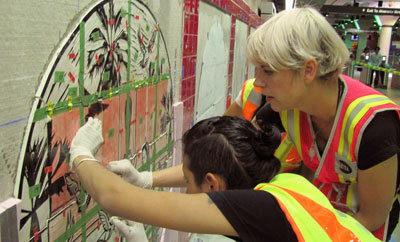 the artist of this large mural is Shinique Smith, a brooklyn based visual artist. 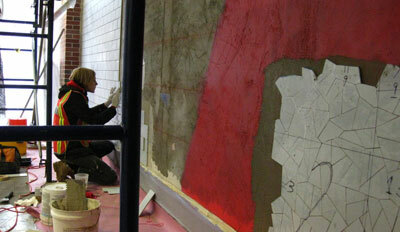 Mosaika is currently installing a large new mosaic by artist Dixie Friend Gay. It’s an eleven hundred square foot mosaic made of hand glazed tiles, three dimensional hand formed ceramic pieces and low relief mosaic inserts. 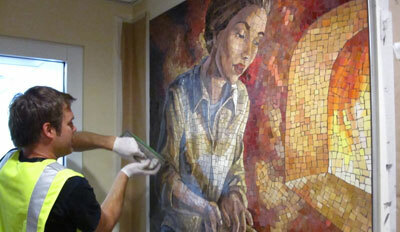 The mosaic is part of a large expansion and renovation of the LOVE FIELD AIRPORT in Downtown Dallas. To see more of Dixie’s work, check out her blog at dixiefriendgay.blogspot.com. 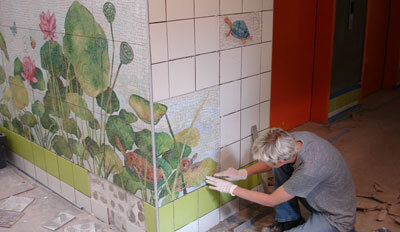 Mosaika is installing a ceramic mosaic by longtime collaborator Dixie Friend Gay. 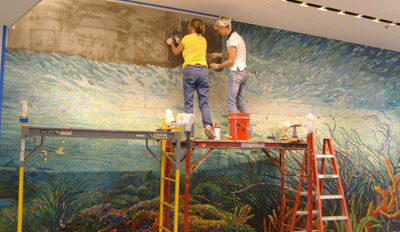 We are installing the artwork at a renovated wing of the St. Vincent Carmel Hospital near Indianapolis, Indiana. To see more of Dixie’s work, check out her blog at dixiefriendgay.blogspot.com. 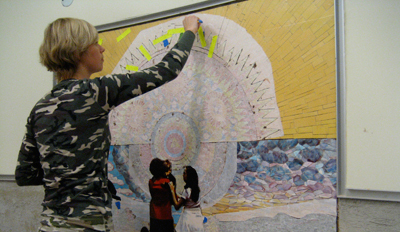 Mosaika is in San Francisco working with visual and performance artist, Johanna Poethig. Johanna has been doing public art for over twenty years and Mosaika is proud to be collaborating with her on a series now being installed at the Hamilton Recreation Center the 6 mosaic medallions, consisting of glass smalti and hand glazed tile, depict a colorful realm of images and wordplay. 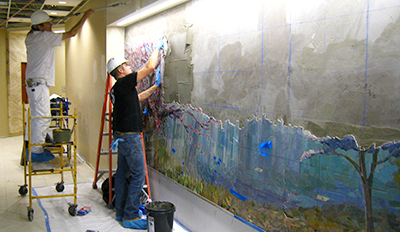 Mosaika is working at the St. Paul international airport installing two mosaics by local artist Barbara Keith, a freelance illustrator, author and glass mosaicist. The mosaics are part of a large renovation the airport is undergoing as part of a 20 year plan to update all the restrooms. 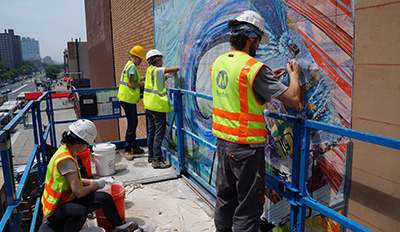 Mosaika is happy to be back in New York city installing a mosaic for the newly renovated Smith and Ninth subway station in Brooklyn. The artwork, by Brooklyn based multi-media sculpture artist Alyson Shotz, depicts the longitude location of the station and is made of hand glazed tiles, aluminium and stainless steel. Mosaika is currently in the beautiful city of Victoria, installing artwork by Joe Wilson; an accomplished, world renowned and prominent coast salish artist and carver. 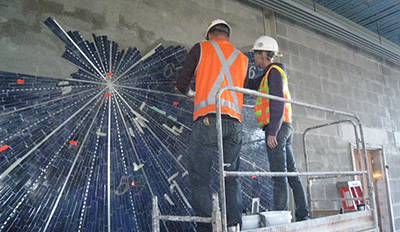 The mosaic is made up of tumbled glass smalti and is being installed as a water feature at Uptown, Victoria’s new outdoor shopping complex. 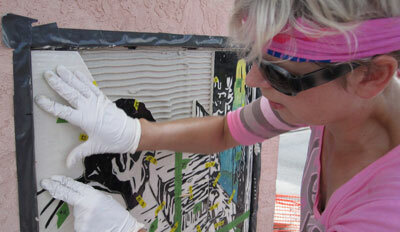 Mosaika is working with Texas based Artist Julie Lazarus in Fort Worth, Texas. 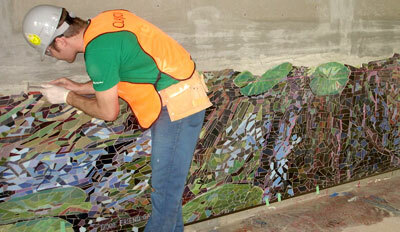 We are installing a large glass and gold smalti mural at the new Westside Water treatment facility in Fort Worth. The vibrant blues and greens represent water and it’s different sources, while the gold lines, circles, and arrows represent the purifying technology of the filtration plant. The rural setting and the modern building pairs well with Julie’s style of combining landscape and architecture. 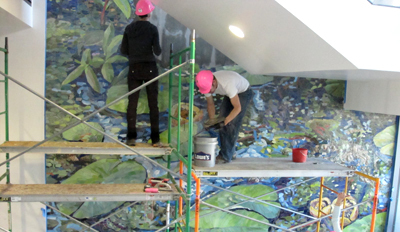 Mosaika is working with chicago artist Lynn Basa again on a dramatic mural that is being installed in the School of Human Ecology at the University of Wisconsin in Madison. Giant orbs of back lit onyx have been incorporated into a mosaic of byzantine glass, gold smalti and hand glazed ceramic tiles. Mosaika is in East Lansing at Michigan State University. 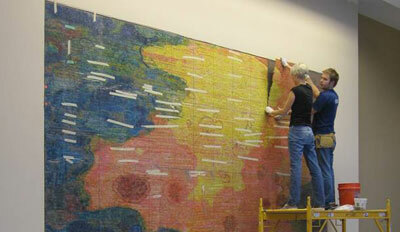 We are installing a 8 feet by 12 feet artwork designed by Anne Marie Karlsen; an artist, professor, and alumni of MSU. The mosaic consists of handformed low relief ceramic tiles and glass smalti. Mosaika is excited to be working with Dixie Friend Gay again. 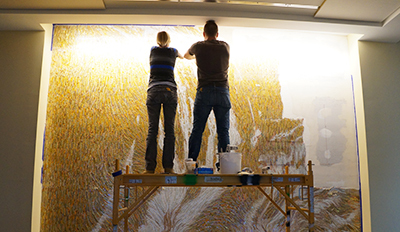 Together we are installing a large mural in a new building for Sam Houston State University at the Lone Star extension campus in the Woodlands. The 950 sq. ft mosaic spans 4 stories and extends outside. It’s made of ceramic tiles, glass smalti and hand-formed ceramic pieces based on pollen, wetland animals and plant life. You can check out Dixie’s Blog Here. 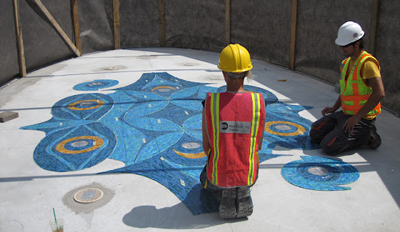 A team of mosaic installers just got back from New Jersey, having finished installing 156 mosaic medallions at the Wildwoods Convention Center in Wildwoods NJ. Designed by Philadelphian artist Tom Nussbaum, each of these tumbled glass smalti mandalas offer symbols of objects and life found along the area’s beaches and boardwalk, as well as pieces of the locally famous “Doo-Wop” architecture; one of the medallions depicts the boardwalk’s historic Ferris Wheel. 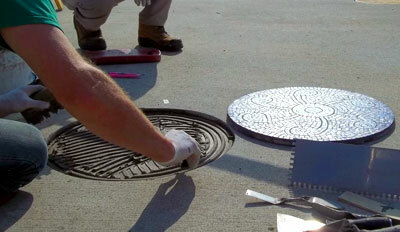 Each recessed medallion is between 6-24 inches in diameter. 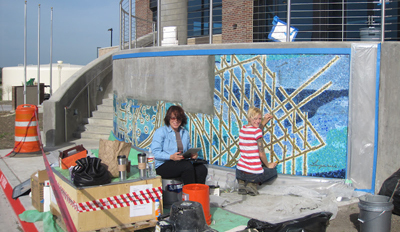 Mosaika is in Des Moines, Iowa installing two glass smalti mosaics designed by artist Kinuko Y. Craft at the headquarters of The World Food Prize. The World Food Prize is an international award recognizing the achievements of individuals who have advanced human development by improving the quality, quantity or availability of food in the world. Kinuko Y. Craft is a world renowned illustrator and painter. She is one of the most widely respected and well known fantasy artists in the United States today. Her works have donned the jackets of books by authors such as C.S Lewis, Carl Sagan, Stephen King and William Shakespere. 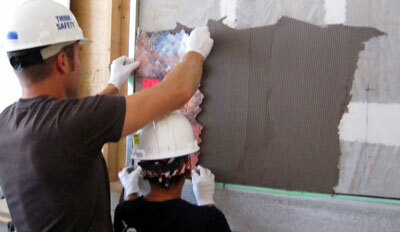 Mosaika’s installation team is in Toronto Ontario, installing what is one of our largest mosaics to date. Designed by Torontonian artist Stephen Andrews, this 950 sq. ft. artwork depicts a large crowd scene; up close the image appears abstract, resolving only from several metres away. It is being installed on the walls of the parking facility in Toronto’s new Trump Towers building. 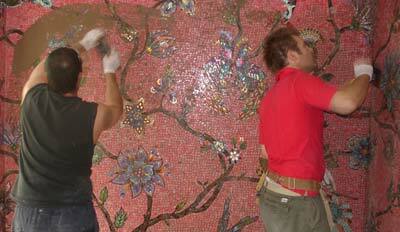 Mosaika is in Brooklyn, New York installing a unique mosaic designed by artist Mary Temple. 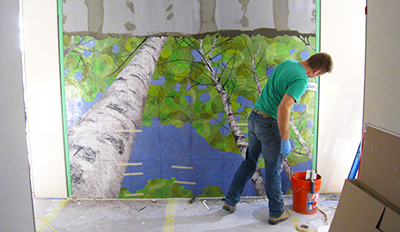 On the MTA’s BQ line, this mosaic is made using ceramic tile, and will depict a faux-shadow effect of trees created to compliment Mary’s original and beautiful artwork. 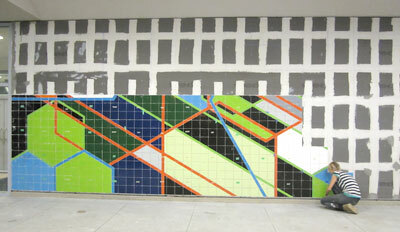 Mosaika is in Queens, New York installing a Sarah Morris piece at a brand new high school opening September 2010. At over 1300 sq. 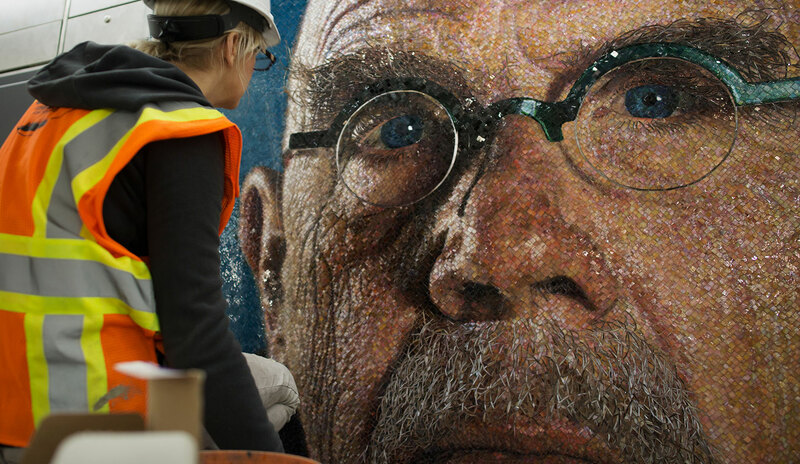 ft., this is Mosaika’s largest and perhaps most complex mosaic to date. Mosaika is back in The Golden State, this time in Los Angeles, working with the LAC MTA installing mosaics in 2 subway stations. 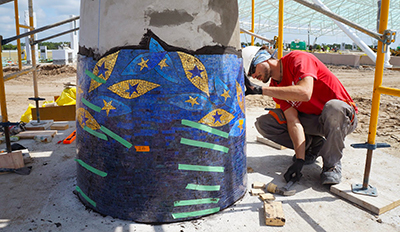 For the Westlake McArthur Park station, Mosaika’s team is installing 13 medallions designed by Sonia Romero, that are made from hand-carved porcelain, depicting different scenes from around the area. At the Civic Center station, acclaimed artist and University of California professor of art Faith Ringgold has designed 52 different colorful smalti mosaics to adorn the walls leading to and from the trains. 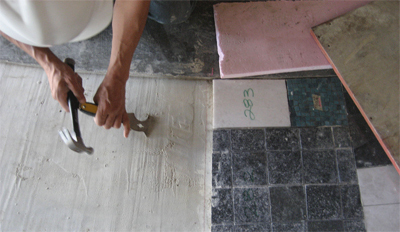 An installation team is in Galveston Texas installing two large mosaics totalling 355 sq. ft. Another collaboration with Public Artist Dixie Friend Gay, these nautical-themed pieces are made of tumbled smalti glass, and were created for the A&M Galveston New Science Building. 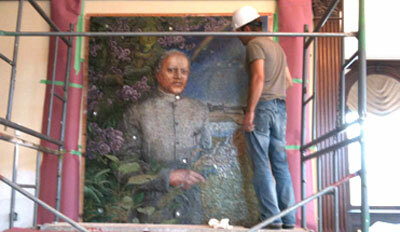 Mosaika is in San Francisco installing 11 mosaics designed by Owen Smith in the Laguna Honda Hospital. These beautiful artworks are made from custom glazed and textured ceramic tile, and cover over 330 square feet in total. 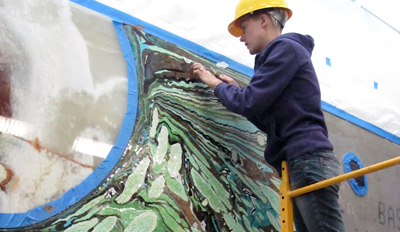 Designed by artist Andrea Fuhrman, this 11 by 36 foot mural entitled “Splash”, is being installed in “Kenwood Cove” – the new water park in Salina, KS. You can read a local news article about this project by clicking here. Based on a series of paintings created for the original “Grove” in Claremont California, author and public artist Lynn Basa created this 150 sq. ft. artwork destined for The Kinzie West Building in Chicago, IL. Longtime Mosaika collaborating artist Dixie Friend Gay designed this 720 sq. ft. mosaic comprised of a myriad of different hand-crafted ceramics, natural stone, glass and smalti. A team from Mosaika will be in Texas for the next week completing the installation on this beautiful and interesting artwork. Mosaika is in Fort Pierce Florida installing a total of 8 mosaics that pay homage to the “Florida Highwaymen”. Concept and design by Stephanie Jaffe Werner. 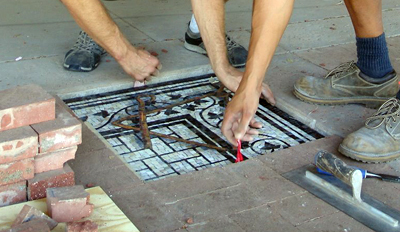 59 mosaic artworks comprised of tumbled smalti are inset into existing sections of paver stones to give this original mosaic the look and feel of an excavation. Each image represents a point in history of the city of Glendale. This 65 sq. ft. mosiac is a translation of a painting created by Public Artist Alex Sax, for a new public primary school located in Brooklyn. It is comprised of hand-glazed and custom-textured ceramic tile, and is intergrated into an existing tile wall grid. As part of this art piece, Alex Sax has sculpted and cast dozens of bronze turtles that migrate up the wall and out the window. The original artwork for this 320 sq. ft. mosaic was created by Public Artist Malin Abrahamsson. 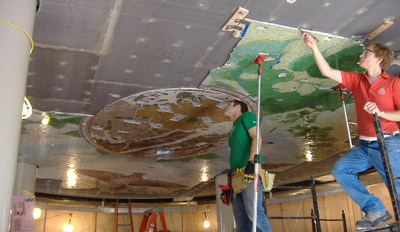 Installed in the Valley Stream Subway Station in Long Island, it is comprised of hand-glazed ceramic tile, with smalti elements. This custom tub surround is a continuation of previous work for a client in Toronto. 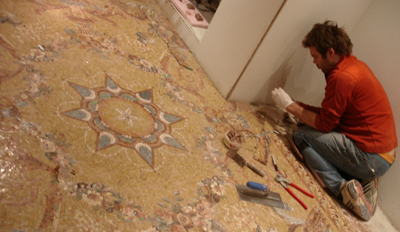 The mosaic is made entirely of iridescent, gold and colored smalti. Snaking its way through a new public library in Fort Worth Texas, this mosaic river is comprised of Byzantine smalti glass, slate and marble sections of different colors and textures. Created entirely of hand-glazed ceramic tile, this 300 sq. 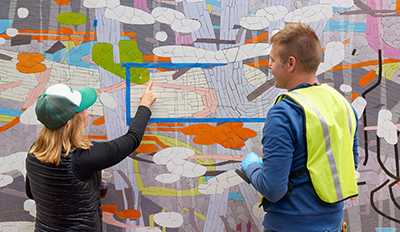 ft. mosaic mural was created in just 8 weeks for the Chevron Headquarters in Louisiana. Original artwork by Dixie Friend Gay. Smalti glass make up this circular entrance way mosaic. Each piece was processed in a tumbler prior to being placed, giving this custom artwork a matte finish with rounded edges and a warm, soft feel. Original artwork by Terry Braunstein. 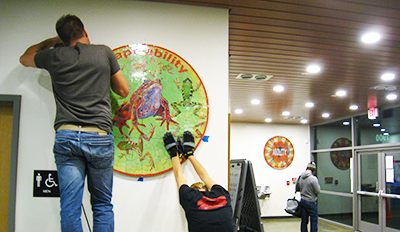 Designed by public artist Terry Braunstein, these mosaics are installed in the new Sun Valley Public Health Center. Comprised of smalti glass, custom glazed ceramic tiles, and photo-transfered porcelain tiles, they cover roughly 300 sq. ft. in total on the walls of the rotunda foyer. A continuation of previous work, Mosaika created these custom mosaics for the master bath in this client’s residence in Toronto, Ontario. The 220 sq. ft. shower surround & ceiling mosaic is made of glass tile with gold accents. 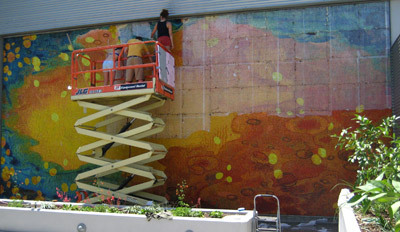 This mosaic was installed on a parking structure in Claremont Village. The region is one of the country’s earliest citrus growing and packing centres, known particularly for lemons. The designer, Public Artist Lynn Basa, paid homage to this tradition with this unique abstract mural. 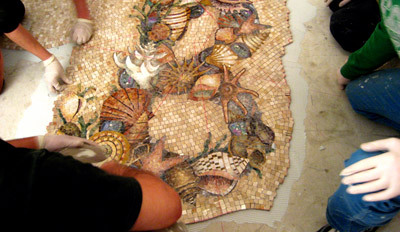 Mosaika created three custom mosaics for this client in Toronto Ontario. Totalling 500 sq. ft., these pieces consisted of marble and smalti glass. Over the course of 8 weeks, Mosaika installed an 800 sq. ft. mosaic on the ceiling of the Myrtle Wyckoff Subway station in Brooklyn, New York.